When I took my kids' toys away, it was a moment of desperation, a time when something had to give. I'm so glad I did and I'll never look back. I used big plastic storage totes left over from our move so I could keep things in the garage and go through them slowly, but boxes or garbage bags would work just as well. Collect all the toys, all the odds and ends, all the lost pieces hiding under the couch, and put them somewhere together where your kids can't come in and dig through it without you. Ours works like this: 5 cards per child. If you hit someone, you lose a card. If you throw a fit, you lose a card. If you disobey, you lose a card. You get the idea. At the end of the day, how many cards each child has left is how many toys they get to choose from storage the next morning. So if my daughter has a really good day, she'll get to choose 5 toys (or toy sets) to bring out and play with tomorrow morning. If she has a bad day and loses 3 cards, she'll only have 2 left and get to choose 2 toys for the next day. 3. Sort and categorize the toys. Throw out any that are broken or store them in a memory box if you just can't let them go. Donate or sell any that don't get played with anymore or are too young for your growing child. Then categorize the rest and put them in their own easily storing bins, baskets, totes, or boxes. We use these and these because they're clear (easy to see what's inside for your pre-readers), stackable, and won't break open easily if knocked off a shelf, which sometimes happens. 4. Find a good location for Toy Storage. It has been nearly a year since I took my kids' toys away. No, they won't ever get them all back. 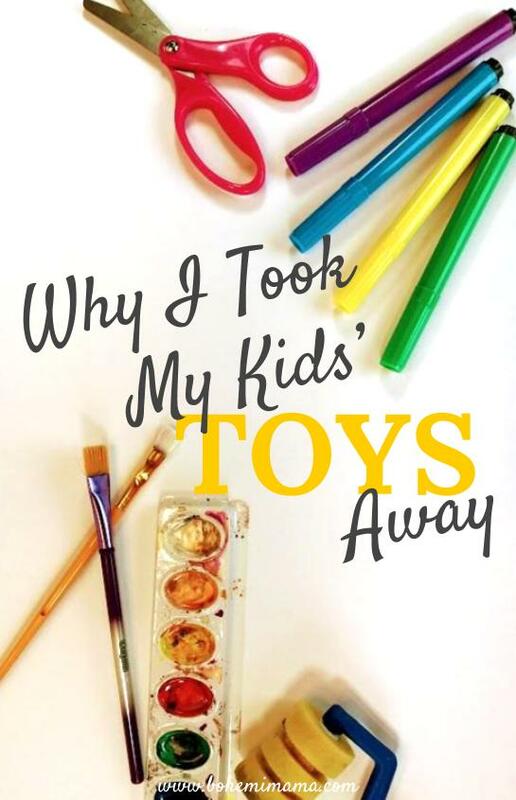 Well over a year ago, I read Ruth's amazing post over on her blog, Living Well, Spending Less, about why and how she took away her kids' toys. I was in awe and, as a mother of two toddlers, totally into the idea. But we had just moved and the girls had a whole room, separate from their bedroom, designated as the playroom. I wanted it to be full of beautiful things and as well organized as those perfect pins I had been collecting for so long. Needless to say, this left me feeling stressed out, constantly worried about the prospect of anyone dropping by unannounced, and grumbling about tripping over things. There were days I would simply drag all the roaming toys back to the playroom, make a big pile in the middle of the room, and call it good. I was growing more and more frustrated by the chaos in our otherwise tranquil home. The toys and the mess and the daily battles to keep it in order were wearing. Me. Down. And then, my oldest started throwing tantrums. Oh, these were big ones; screaming at the top of her lungs, dropping her weight so it was almost impossible to carry her to her room for time out, kicking the walls and door once she was safely delivered to baby jail. We tried letting her cry it out, putting her to bed earlier, cutting out refined sugar and artificial food dyes and taking away the tablet. We even resorted to spanking (never angry and always pre-warned). Nothing worked. Then one night, she threw herself down because she didn't want to wear the pair of pajamas I had laid out for her. You read that right. She was coming up on her fourth birthday and had all the words she needed to ask me for another pair, but instead, she took one look at the bed and let out a monstrous scream. I couldn't even get her calm enough to talk to her. It was a nightmare. I turned away from her, stomped downstairs, grabbed a big garbage bag, and then paused to take a deep breath... Once I was back in my head, I walked calmly upstairs and began to pack all of her stuffed animals and books (the only toys allowed in their shared bedroom) into the garbage bag. I stripped her bed of the Frozen comforter and pillow case and replaced them with plain ones from the linen closet. All of her sister's special things stayed in place because my youngest wasn't the one throwing the fits. My oldest didn't even stop screaming long enough for me to explain what I was doing. I took the bedroom things to my room where they would stay until she earned them back. Then I went downstairs to the playroom. My husband put the girls to bed and my oldest cried until she fell asleep that night (which didn't take long). By the time he got downstairs, I had all the empty totes from the garage spread out in the playroom and I was tossing everything into them. In went the dolls, the plastic animals and dinosaurs, the instruments, the play food, the dishes. In went the felt play scenes, blocks, little people sets, dress up clothes, puzzles, books... everything. It took me two hours. Once each tote filled up, my husband took it out to the garage. The only exceptions were my younger daughter's three favorite things: two dresses and a cape. The playroom shelves were empty, the art table clean for the first time in a long time, the floor uncovered and trip hazard free! My husband and I talked it out and then we came up with a plan. We decided on a reward system. This is how it works: Each morning, my girls start with 5 cards each. My oldest helped me make and decorate the construction paper cards and we hung them on the fridge where we'd all see them. Grace is new every morning, so are my kids' chances to have a good day. If they throw a fit, or fight with each other, or disobey, or act in an unkind way, or hit/bite/kick, or anything else they know is not an okay behavior, they lose a card. At the end of the day, if they have 2 cards left, they get to choose 2 toys to play with for the next day. If they have all 5 left, they get to choose 5 toys the next day. We talked about it all together, at 10 am when everyone was happy, and the girls agreed that it was okay. I spent the next two weeks organizing the toys in the garage and we created the toy closet, a utility closet under the stairs, with what toys were left after we donated or sold about a quarter of what they'd had. Within one week, my daughter's tantrums disappeared. She spent the first three days using the 1-2 cards she had left to 'buy' back her comforter, pillowcase, and room things. The next three days, she used the 2-4 cards she had left to 'buy' back some stuffed animals and choose a toy or two to play with the next day. On day seven, she finished the day with all 5 cards and all four of us did a happy dance in the kitchen with her. She was even more proud of herself than I was, which is saying something, and we've never looked back. Within two weeks of removing all the toys, I found myself way less stressed, clean up times were surprisingly easy and battle-less (they have to put their toys away each night or they lose a card and get one less toy the next day), and we were all happier. The most surprising side effect of the whole deal though came in the form of lasting change. One day while I was cleaning up after breakfast and the girls were in the playroom, I heard them playing bakery. They'd played this game before, but only if they had the right toys, meaning the plastic dishes and proper dress up clothes. We had just picked toys for the day and I knew they hadn't chosen either of those things. Instead, they had a wooden food cutting set and they were pretending the food pieces were the bakery, standing in for everything from the mixing bowls to the baked goods to the spatulas. Later in the day, that same food cutting set became a box of moon rocks, a stencil set, and a collection of special gifts for the queen. Our consumerist culture tells us we have to have exactly the right tool or utensil to do a job. How else do you think we get inventions like this and this and this? Instead of having one high-quality tool which we use for a multitude of jobs, consumerism tells us we have to have a dozen specialty tools for one specific job each. It's the same with our kids. If you give them a Cinderella themed castle, chances are they are going to want to only reenact the Cinderella storyline with that castle, especially if they have the right dolls and dresses to go along with it. 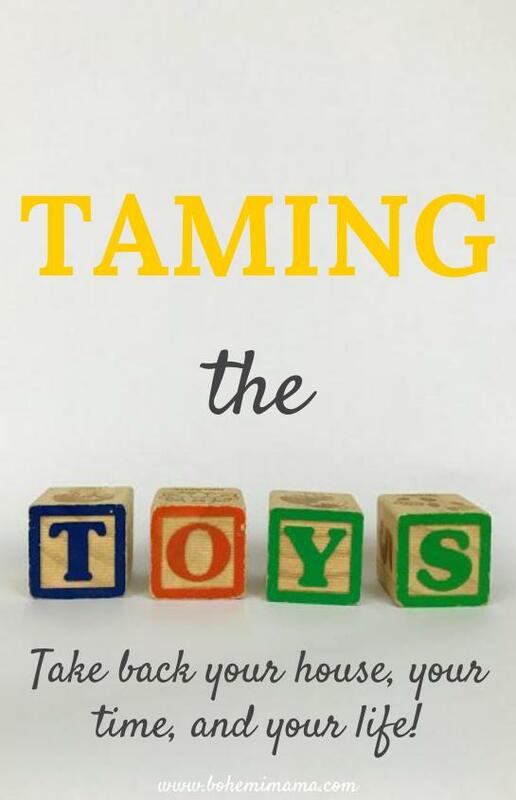 Give them only a few, preferably generic, things to play with and, surprise!, they'll engage their creativity and imagination to use that one toy for a multitude of activities. I don't know about you, but creativity is a major value which I want to cultivate in my future adults! Taking away their toys made them appreciate what they had, lifted significant stress from my shoulders, and encouraged them to play together nicer and work together to invent new ideas. I'll never go back to a room full of toys! How about you, do you have any similar systems and how does it work for your kids? Anything you would add? Share with us in the comments!